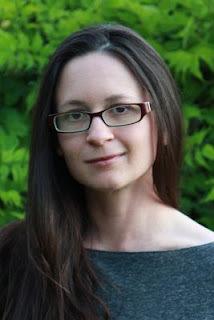 Please welcome Tina Connolly to The Qwillery as part of the 2012 Debut Author Challenge Interviews. 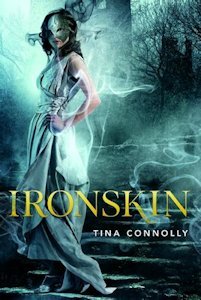 Ironskin, Tina's debut, was published on October 2, 2012! TQ: Welcome to The Qwillery. Tina: Thanks so much for having me! TQ: Writing quirks! What are some of yours? Tina: For novels, I like to write a sort of book pitchy thing before I write the book (or at least, before I've written most of the book.) 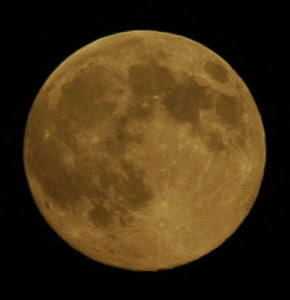 It keeps me focused, and it also lets me see if there are major structure problems. I started doing this after I wrote my 3rd novel (a quirky MG) and then tried to write up a query letter for it. I had the hardest time making the pitch sound logical...because the character who drove the plot was not the main character. Whoops! TQ: Who are some of your favorite writers? Who do you feel has influenced your writing? Tina: Oh, this is a long list. My favorite all time fantasy writer is Diana Wynne Jones. In the kickass fantasy heroines department, I also love Robin McKinley and Kristin Cashore. I also recently read Rae Carson's first book and tore through that. On the adult fantasy side, I love Dave Duncan for his detailed worldbuilding and complex magic systems. And Sharon Shinn for worldbuilding plus a good romance. And then, classics - my favorite all time writer ever is Jane Austen. But I obviously also love Charlotte Bronte (my favorite is actually Villette, which is amazing), Edith Wharton... Margaret Atwood for her deeply feminist (if sometimes depressing) books. Saki for his incisively funny short stories.... Take bits of all that and stir, I guess! Tina: I'm not sure if I'm really either! 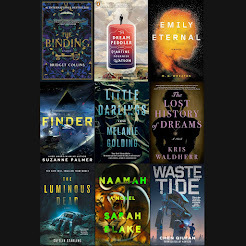 I come from short fiction, where I have a ridiculous process of jumping all around an idea, writing down random things and scenes I know. Eventually a story starts to emerge. This turned out to be fairly unworkable for novels (though I did, painfully, write one book this way (my possibly unfixable Great Experimental Lawrence Kansas Novel). So nowadays I'm more to the plotter side - I start with a very loose overarching idea, and then start going back and forth between writing and outlining. TQ: Describe Ironskin in 140 characters or less. Tina: Steampunk Jane Eyre with fairies! Of course it's not exactly steampunk, doesn't precisely follow the JE plot, and the fey aren't particularly tinkerbelly. But it's a good jumping off point. TQ: What inspired you to write Ironskin? Tina: Ironskin actually started in 2007 as a novella written for a gothic anthology call. They didn't take it, but it was a finalist at Writers of the Future, which encouraged me to go back to it and develop it into a novel. That's the genesis of the plot, but as far as the driving impetus behind actually writing it, I'd say I tend to write a lot about beauty and feminism and power and the intersection of all those. The story structure I had gave me a lot of room to explore those themes. TQ: What sort of research did you do for Ironskin? Tina: Ironskin is not meant to be historical fantasy, but at the same time I wanted to give my world a good grounding. One of the more important worldbuilding points is that the book is set five years after a devasting human-fey war. So I ended up reading a lot of books about England post-WWI. My technology (among other things!) has gone at a different rate in Ironskin, but it was a good jumping-off point. One book I particularly liked was called "The Great War and Modern Memory", by Paul Fussell. TQ: Who was the easiest character to write and why? Hardest and why? Tina: Jane was tricky at the beginning, because in the original story, Jane's curse was closer to depression. I realized pretty quickly that was not going to give me a character who could drive an entire book. Once I got a handle on how rage would fit for Jane, she went much more smoothly. Easiest was perhaps Nina, who says the most awful things and is completely sure of herself. She was fun to write. TQ: Without giving anything away, what is/are your favorite scene(s) in Ironskin? Tina: Oh, a bunch, of course! But a non-spoilery one is I had fun writing the first ball sequence at Helen's house, particularly the point where the three old women (Pince-Nez, Shoes, and Handkerchief, as Jane internally dubs them), reminisce about the old days. There are also some fantastical books that pop up in the story and I always love making up those. Tina: Thank you for having me! Jane Eliot wears an iron mask. It's the only way to contain the fey curse that scars her cheek. The Great War is five years gone, but its scattered victims remain -- the ironskin. When a carefully worded listing appears for a governess to assist with a "delicate situation" -- a child born during the Great War -- Jane is certain the child is fey-cursed, and that she can help. 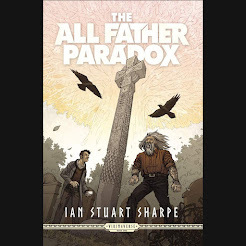 Teaching the unruly Dorie suppress her curse is hard enough; she certainly didn't expect to fall for the girl's father, the enigmatic artist Edward Rochart. But her blossoming crush is stifled by her own scars, and by his parade of women. Ugly women, who enter his closed studio...and come out as beautiful as the fey. Jane knows Rochart cannot love her, just as she knows that she must wear iron for the rest of her life. But what if neither of these things is true? Step by step Jane unlocks the secrets of her new life -- and discovers just how far she will go to become whole again. This book sure has grabbed my interest and I am looking forward to reading it. The cover is absolutely beautiful! Something about the background and those stairs....I am aching to find out what lies beyond those steps!